Sat, Jul 7, 2018, 07:12 pm SL Time, ColomboPage News Desk, Sri Lanka. July 07, Colombo: President Maithripala Sirisena will inaugurate filling water to the Kalu Ganga reservoir that is being built in parallel to the Moragahakanda reservoir under the Moragahakanda-Kalu Ganga multi-purpose irrigation project and the construction of the canal taking water from the Kalu Ganga reservoir to Moragahakanda reservoir on July 23. 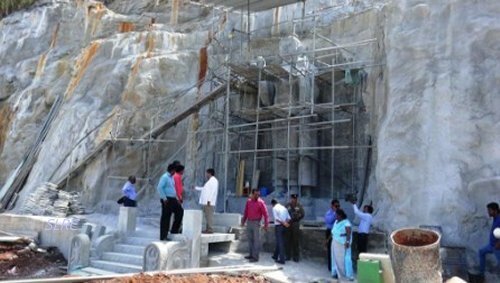 Unveiling of the new granite Buddha Statue which was built opposite the Moragahakanda Reservoir and renaming Moragahakanda Reservoir as 'Kulasinghe will also be carried out on this occasion, the Chief Resident Engineer of the Kalu Ganga project Lal Kumarasiri said. 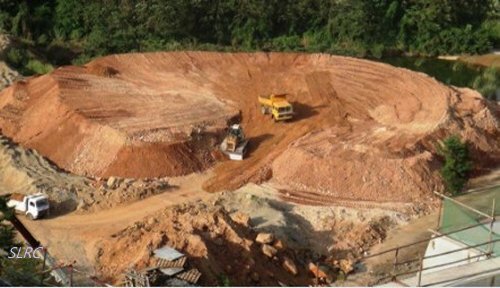 State Minister of Mahaweli Development Weerakumara Dissanayake and a group of Mahaweli officials yesterday visited the Kalu Ganga reservoir to inspect the progress of the construction of the reservoirs and Elahera canal. The Mahaweli officials and the State Minister initially inspected the construction of the 102-kilometer Elahera canal, which takes water from the Moragahakanda Reservoir for distribution to the North central and Northern provinces. The Minister discussed the existing problems and instructed the contractors to expedite the work on the construction to complete the project. Later, State Minister Weerakumara Dissanayake together with the delegation visited the Kalu Ganga reservoir, which is scheduled to be opened by the President on 23rd of this month, and observed the construction of the Reservoir and the dam across the Kalu Ganga. The State Minister also inspected the functioning of the Moragahakanda hydro-electricity plant, which generates 25 Megawatt hydro-power to the national grid, and the construction of granite Buddha statue in front of the Moragahakanda reservoir. Speaking to the media, Minister Weerakumara Dissanayake said that measures are being taken to resettle the people displaced by the construction giving them reasonable compensation as well as to commence new city projects. The Minister also instructed the officials to swiftly resolve the issues that have arisen and complete the mega project. Expressing his views the resident engineer Lal Kumarasiri said the construction of the Kalu Ganga reservoir was commenced in 2014 and the construction of the levees will be completed by December this year. At present they are experimenting with filling the reservoir before the official opening by the President on the 23rd. The Moragahakanda-Kalu Ganga multi-purpose irrigation project at a cost of US$ 1.2 billion involves the construction of the Moragahakanda Dam and Reservoir, along with the separate Kalu Ganga Dam and Reservoir, for irrigation and power generation purposes. The construction of the Moragahakanda Reservoir was completed last year. The Moragahakanda-Kalu Ganga project will provide irrigation facilities to 81,422 hectares in the dry zone of Sri Lanka, provide potable and industrial water supply to Anuradhapura and Trincomalee towns and generate electricity by hydropower while opening up 5000 hectares of new land for agriculture development in Northern, North Central, Eastern and North Western provinces.